Note: *Quebec was excluded because the data were not available for all years. Source: CICH graphic created using data adapted from Table B4.1 in Public Health Agency of Canada. Congenital Anomalies in Canada 2013: A Perinatal Health Surveillance Report. Ottawa: Public Health Agency of Canada; 2013. http://publications.gc.ca/collections/collection_2014/aspc-phac/HP35-40-2013-eng.pdf – accessed June 20, 2017. For more information on congenital anomalies see Section 5: Congenital Anomalies; Genetics and Paediatric Health Module. 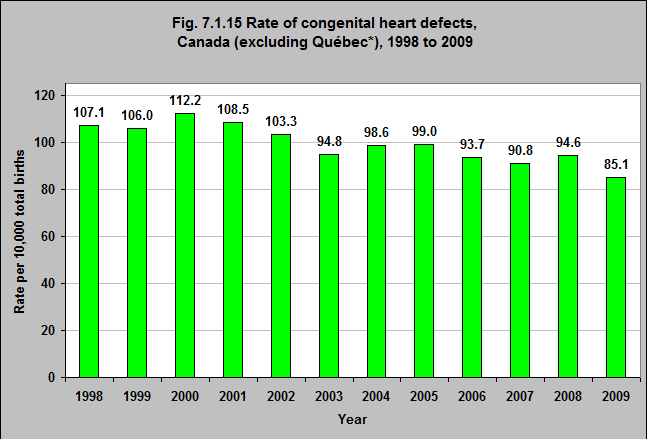 The rate of congenital heart defects (determined up to 30 days of age) has decreased from 1998 to 2009. In 1998, the rate was 107.1 per 10,000 total births. By 2009, that rate had decreased by 21% to 85.1.